Where to apply for research grants and institutional support? Interdisciplinary Workshop Grants, making it possible to organise a South Asia related interdisciplinary research workshop in Sweden or in South Asia. Information on the applications for which grants have been given 2001–2009. Please note, no SASNET grants are distributed any longer! In 2010, the Asia-Europe Meeting (ASEM) initiated a new specific DUO-Sweden Fellowship Programme. It is being administered by the Swedish International Programme Office for Education and Training, a government agency that promotes academic exchanges and cooperation across national borders. ASEM-DUO is an exchange programme for lecturers and students from Europe and Asia, where participating countries exchange one lecturer/student. The ASEM-DUO Fellowship Programme, commenced in 2001, has supported exchanges of professors and students in tertiary education field between Asia and Europe under ASEM domain. Students can study abroad between 4-6 months and lecturers can spend one month abroad. 3) The same Asian host institution has selected an Asian student enrolled at the host institution to send to the Swedish home institution, and such selection has been accepted by the same Swedish home institution. Out of 43 applications for the first year (2010-11) year, 13 were granted. None of them however applied to South Asia. Applications for the DUO-Sweden Fellowship Programme 2011–12 had to be delivered during the period 26 April – 27 May 2011. Supports scientific research by awarding project grants to individual researchers and research groups. The foundation is the largest Swedish financier of research outside the universities and university colleges in the humanities and social sciences. Supports post-doc research within the faculties of Humanities and Social sciences. Closing date for applications 2010 was Wednesday 10 February 2010. Detailed information on applications (in Swedish only). Twice each year the Crafoord Foundation distributes funds to those who apply for two main types of grants: Research Grants and Other Grants. The main purposes are to promote scientific training and research. The purposes of the Foundation include promoting Swedish scientific training and research without a view to making a profit for a given individual person or organization. Grants for research are awarded to applicants at Lund University, Linnaeus University, Malmö University, Kristianstad University College, the University of Halmstad, Blekinge Institute of Technology, and the Swedish University of Agricultural Sciences at Alnarp. In 2008, the Crafoord Foundation received about 600 applications and granted SEK 45 million (SEK 50 million in 2007) for scientific research. The next deadline will be in February 2011. The Swedish council for working life and social research. The Council was established in 2001 through a merger of the Swedish Council for Social Research and the Swedish Council for Work Life Research. The Council supports research by giving grants for projects. The council also creates research positions at Swedish universities and provides grants for visiting researchers as well as scholarships for post-doc studies abroad, during a period of 624 months. Applications are made in two steps. A short application should be given before 1 February, and if that one is approved a more thorough application should be given before 1 June. For smaller amounts, maximum 30 000 SEK, applications can be made anytime during the year (but 8 weeks in advance of the researchers departure). FAS has drafted a research strategy for the period 2005 to 2008, ”Researching people’s work and living conditions”. More information (only in Swedish). A governmental research-funding agency, established in 2001, related to the Ministry of Environment, the Ministry of Agriculture, the Ministry of Industry, Employment and Communications and the Ministry of Education and Science. Formas supports basic research and applied research in the fields of the environment, agricultural sciences, building sciences and urban development. Formas promotes ecologically sustainable growth and development in society, multi- and interdisciplinary research and international research cooperation and experience interchange. Every year, Formas announces grants for research and development projects within all the fields mentioned above. More information. A Joint Formas – Sida/SAREC funded program for research on sustainable development in developing countries was announced in 2007. The program aims to promote participation of scientists from Sweden in sustainability research in developing countries, with an overall intention to contribute to global sustainable development in the spirit of the UN Conference in Johannesburg 2002. Decisions for the latest round, for the period 2010-11 were taken on 10 April 2010. Information about the South Asia related projects awarded grants. An Environmental technology program, jointly funded by Research Council Formas and VINNOVA. In early 2007, the two institutions were mandated by the Swedish Government to draw up a common research strategy for environmental technology. The objective of the research strategy is to make a concerted effort concerning research and development of environmental technology. The strategy intends to promote the development of new knowledge and to strengthen competence in the field of environmental technology, and to promote Swedish competitiveness in the global market for environmental technology. Formas is now advertising a call for applications for research grants in the field of environmental technology. The total funds available for the period 2008-2010 amount to SEK 15 million. Last day of application was Monday 18 February 2008. More information. Formas is also partly responsible for the Swedish contacts with the EU programmes under the 5th Framework Programme on Environment and Quality of Life. FSTAM, offers funding for students dealing with international organisations and co-operation. IFS is a research council with international operations and the mission to build the scientific capacity of developing countries in sciences related to the sustainable management of biological and water resources. The secretariat is located in Stockholm. Funding comes from governmental and non-governmental sources, as well as national and international organisations. IFS has 135 Affiliated Organisations in 86 countries, of which three-quarters are in developing countries and one-quarter in industrial countries. At IFS, the idea is that the interests of both science and development are best served by promoting and nurturing the research efforts of promising young science graduates, who have the potential to become leading scientists in their countries. Since 1974, IFS has provided support to more than 4,600 IFS Grantees in some 100 developing countries in Africa, Asia and the Pacific, Latin America and the Caribbean. Applications for IFS Research Grants are welcome from young scientists in developing countries to do research on the sustainable management, use or conservation of biological or water resources. This broad statement covers natural science and social science research on agriculture, soils, animal production, food science, forestry, agroforestry, aquatic resources, natural products, water resources, etc. Grants are normally awarded to individual researchers, for a specific research project lasting 1-3 years. Application deadlines are 30 June and 31 December every year. More information on Eligibility Criteria. One of the major research funders in Sweden and supports research and educational projects at the national universities, colleges and comparable research institutes. During 2004 a total of SEK 786 million were awarded to around hundred different projects. Most of the grants were donations for expensive scientific equipment within the natural sciences, technological and biomedical basic research. An exchange programme for teachers and students at undergraduate and master's level in higher education, which aims at strengthening co-operation between universities in Sweden and developing countries. The Programme was established in May 2000 and is financed by Sida, Swedish International Development Cooperation Agency, and administered by the International Programme Office for Education and Training (Internationella programkontoret). Last date for applications to the programme for 2012/13 is 15 November 2011. More information. The decisions for 2011-12 were taken in April 2011. Out of 240 projects given grants, 4 are with Bangladesh, 16 with India, 2 with Nepal, 1 with Pakistan, and 4 with Sri Lanka. Go for the full list of Linnaeus Palme grants 2011 (as a pdf-file). Grants for field studies, aimed at giving Swedish students the opportunity to procure knowledge on developing countries and development issues. This programme also aims to give students, lecturers and institutions at universities and colleges the opportunity to establish contact with institutions and organisations in developing countries. financed by Sida, Swedish International Development Cooperation Agency, and administered by the International Programme Office for Education and Training (Internationella programkontoret). Decisions for 2011 were taken in January 2011. Grants were given to 812 applications at 107 departments/international offices at 34 universities. See the list. A large number of Swedish undergraduate students have got MFS grants to do thesis work in developing countries. A searchable database where all MFS theses since 2003 are presented in full-text is available. Go to the database. See also specific lists of South Asia related MFS projects during the period 2003-07: – Afghanistan (1 project); – Bangladesh (17 projects); – India (120 projects); – Nepal (7 projects); – Pakistan (3 projects); – Sri Lanka (29 projects). No projects were carried out in Bhutan and the Maldives. The Greenchem programme (Speciality Chemicals from Renewable Resources), involving researchers from The Department of Biotechnology, The Division for Environmental and Energy Systems Studies, and The Research Policy Institute at Lund University; and parts of the Water management research programme, VASTRA, involving researchers from the Department of Water and Environmental Studies, Linköping University. Offers scholarships and grants to young people for international exchange, and for studies of peace and disarmament. Sida offers several types of grants, exchange programmes and scholarships, which can be related to South Asian studies, through its Department for Research Cooperation (SAREC). Go to the information page regarding Support to Researchers! SAREC also supports research organisations, universities and research institutes in partner countries as well as regional research networks and international research programmes, besides providing support for development research in Sweden. Sida's Developing Country Research Council (u-landsforskningsrådet) supports Swedish developing country research. • Grants to support Swedish development research are provided by the Swedish International Development Cooperation Agency, Sida, through its Developing Country Research Council (u-landsforskningsrådet). These so-called uforsk grants belong to the most important ways of financing Swedish research projects related to developing countries, including South Asia. The aim is to establish and maintain a knowledge base of relevance to aid and development issues, plus capacity for developing country research in Sweden. Deadline for applications for the period 2012–2014 is Tuesday 12 April 2010. Individual researchers or groups of researchers working at Swedish universities and colleges or other Swedish research institutions may apply for a grant. . Among the new stipulations set up by Sida in 2009 are requirements that the proposed research projects should have a clear relevance for Sweden’s policy for global development (PGD, decided upon by the Swedish government in 2008, more information); and have a land focus in accordance with the Swedish government’s priorities – which in the South Asia case means primarily Bangladesh and Afghanistan and in a selective mode also India. In accordance with the PGD, Sida has been instructed to make priority to projects dealing with poverty reduction. Focus has been put on three preferential thematic areas, namely: – Democracy and human rights; – Gender equality and women’s role in development; and – Environment and climate change. As an additional preferential focus area in the 2009 applications, the Swedish government decided to contribute to set up a long-term action plan for the global fight against contagious diseases, and support research within this field with specific funds. On 8 February 2010, the Swedish Civil Contingencies Agency (MSB) and the Swedish International Development Cooperation Agency (Sida) announced a jointly funded call on the research theme of the global fight against communicable diseases by developing the capacity in the handling and prevention of these. The MSB (Myndigheten för samhällsskydd och beredskap) and Sida will together fund a three-year program with the aim to increase cooperation between scientists from Sweden and in developing countries within the research area of communicable diseases. The overall intention is to increase the ability to combat the global spread of contagious diseases (which currently threaten both developed and developing countries) through knowledge production in terms of research results. The program starts in 2011 and with approximately 20 milion SEK available in the first year, it will contribute to an increase in capacity to limit the spread and impact of contagious diseases. Approximately 20 million SEK will be available the first year, with the MSB and Sida contributing equal shares. The scope of this call covers major threats and challenges to health and society, both of mutual interest to Sida and the MSB, and addresses sources, pathways and mitigation measures. More information. Because of a strained economy, Sida will not give away any Planning Grants, Swedish Research Links Programme Grants (see below), and Grants to new Networks in 2010. Joint Formas – Sida/SAREC funded program for research on sustainable development in developing countries. The research council Formas and Sida/SAREC together has funded a two-year program with the aim to promote participation of scientists from Sweden in sustainability research in developing countries. The overall intention is to contribute to global sustainable development in the spirit of the UN Conference in Johannesburg 2002. The program started on 1 July 2007 and have the volume 10 million SEK per year, with Formas and Sida/SAREC contributing equal shares. The main applicant should have a PhD and should be employed at a Swedish university or research institute. The project should have a co-applicant (also PhD), employed by the host organisation, who will actively participate in the research. More information. Thematic research. 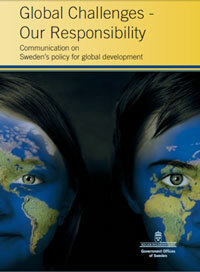 SAREC supports Swedish research on vital Global issues. They include ”Financial Systems in the Third World”, Democracy, Human Rights and the Rule of Law”, Education for Poverty Alleviation”, ”Research on IT in developing countries”, ”Biological multitude focused on its importance for poor people’s survival”, and ”Climate Change”. Support to HIV/AIDS research. Since 1989, Sida has supported research on HIV/AIDS and related sexually transmittable diseases relevant for the situation in developing countries. Sweden and Sida are intensifying the fight against the pandemic by increasing the support and by maintaining HIV/AIDS as a strategic issue in all development cooperation. In 2006, three South Asia related projects were among the 22 being funded. More information. The Indo-Swedish Facility for Environmental Initiatives and Innovations (”the Facility”). Was set up by Sida in December 2006, with an aim to encourage knowledge sharing and co-operation on development of new technical solutions between India and Sweden, and to evolve best practices in the environmental field. The Facility offers funds to apply for, and is open to Swedish and Indian public institutions, the private sector, civil society and research and academic institutions. On the Swedish side it has been administered by an officer at the Swedish Embassy in New Delhi. From 2007 the Facility has been fully operational. More information, including guidelines and full background material.  Institutional Grants (IG) programme supports new international collaborations in research and higher education within all disciplines and all countries in the world.. This programme was initiated in 1996. So far the STINT Foundation has funded 300 IGP projects, close to one hundred are still active. The IGP includes all areas of higher education and research. The programme is open for cooperation with all countries. Gives opportunities for broad and long-term co-operation between Swedish and foreign institutions or academic groups in one or several countries. The scope of co-operation should, as far as possible, include research as well as higher education. Deadline for applications starting the academic year 2011/2012 is 1 December 2010. Decisions will be taken in April 2011. More information. On 12 April 2007, STINT decided to award Institutional Grants to 17 new projects, out of which two involves collaboration with South Asian research groups. Dr. Devdatt Dubhashi at the Dept. of Computer Science and Engineering, Chalmers University of Technology, Göteborg, was awarded SEK 800 000 to establish research collaboration with Prof. Krithi Ramamritham at the Dept. of Computer Science and Engineering, Indian Institute of Technology (IIT) in Mumbai; and Dr. Gunilla Krantz, Dept. of Social Medicine, Institute of Medicine, The Sahlgrenska Academy, Göteborg University, was awarded SEK 600 000 to establish research collaboration with Dr. Tazeen Saeed Ali, School of Nursing, Aga Khan University, Pakistan. – STINT Networking Grants for the Humanities and Social Sciences. Scholarships to encourage Swedish researchers in the humanities and social sciences to develop their international contacts. The grants are to be used for meetings with colleagues from other countries with the aim of developing joint research projects with an international profile, summer schools or courses for researchers, again with an international profile. A condition of the grant is that several researchers from the different groups are involved and that the planning is clearly focused. Applications for the networking grants can be made at any point in the year. The maximum amount granted is SEK 100 000 and covers a two-year period at most. More information.  Scholarships for Swedish doctoral candidates. Scholarships for doctoral studies at a foreign academic institution in the humanities and social sciences, including theology, religion and law. The scholarships provide opportunities for Swedish doctoral candidates to spend one term (a minimum of four months) at a foreign academic institution. To ensure that the students benefit from the visits, it is the responsibility of the applicant to make sure that solid contacts are made with the foreign host institution. STINT encourages the involvement of the student’s Swedish department. STINT may include a travel grant for supervisors to visit the host department during the doctoral student’s stay. Applications for scholarships for the academic year 2011/2012 shall be submitted by 1 December 2010. More information.  Short term stipends. Opportunities for faculty at Swedish universities to spend a maximum of three months at a foreign academic institution. The programme covers all areas of research and higher education. Doctoral candidates are not eligible to apply. The programme also provides opportunities to invite foreign faculty as visiting researchers or academic teachers at Swedish universities. Foreign faculty at Swedish institutions is an effective way to widen international networks. The time spent abroad (or engaging foreign faculty in Sweden) can be used for teaching as well as research or a combination of both. Short Term Stipends can not be used to sustain ongoing cooperation. Applications can be submitted at any time. They should reach the STINT Foundation no later than eight weeks before the start of the planned period abroad. More information. The SI offers grants for post-graduate studies and research in Sweden and abroad, as well as for International development cooperation in the cultural and public spheres (including expert exhanges with developing countries). The Guest Scholarship Program is open for PhD students and post-doc researchers from South Asia. The scholarship is open for all subjects. The scholarship amounts to SEK 12 000 per month for PhD researchers and SEK 15 000 per month for post-doc researchers (holders of a PhD degree). The number of scholarships are however extremely limited, so the chances of receiving a scholarship from the Swedish Institute are rather small. Scholarship periods are fixed to 6, 12 or 18 months. The scholarship periods cannot be altered or prolonged. Travel grants are also given to accepted scholarship holders, a lump sum of SEK 10 000 will be paid. Deadline for applications is 31 January 2011. More information. The Swedish Institute Study Scholarships are targeted at highly qualified students from 12 developing countries with which Sweden conducts long-term development cooperation – in South Asia only Bangladesh is included. Scholarships will be awarded for studies in Sweden mainly on second cycle (Master's level) from autumn 2011. Scholarships will cover both living costs and tuition fees. A few scholarships will be awarded for studies at first cycle (undergraduate) level. About 80-100 scholarships will be offered for the academic year 2011/2012. Applications should be made online between December 1, 2010 and January 21, 2011. Only applicants who have been accepted to an eligible study program will come in question for a SI Study Scholarship. Scholarship holders within the SI Study Scholarships will receive a travel grant in connection with the scholarship. The travel grant is a lump sum of SEK 10.000. The Swedish Institute will publish a list of successful applicants who will receive a scholarship in the beginning of April 2011. More information. The Travel Grants for Expert exhanges with developing countries is intended to promote both openness and democratic, economic and social advancement in developing countries through the transfer of knowledge and experience in the fields of democracy and human rights, gender equality and the role of women in development. Exchanges of experts are short projects of an opinion-making and policy-oriented nature, such as seminars, workshops, leader training, visit programs for senior decision-makers, experts, opinion-makers and other agents of change, and other activities leading to achievement of the program goals. SI will give precedence to projects with a communicative dimension that possess the potential for wider dissemination and which can help shape opinion and encourage dialogue on the issues raised. Funding may not be sought for research projects, study trips, school exchanges, commercial contact, volunteer activities, exchanges for children or young people, reconnaissance trips or attendance at conferences/courses without central/national participation. Nor may funding be sought for humanitarian efforts. The target group for exchanges of experts comprises decision-makers, experts, opinion-makers and other agents of change in the fields of democracy and human rights, gender equality and the role of women in development. Countries covered by the SI expert exchange programme are listed by the OECD in its DAC list of Official Development Assistance countries. In South Asia, this means the program prioritises applications regarding Bangladesh and Afghanistan. Signing of the agreement in 2004. The chairman of Pakistan's Higher Education Commission, Dr. Atta-ur-Rahman (central position), along with Mr. Erland Ringborg, General Director of the Swedish Institute and Mr. Shahid Kamal, Ambassador of Pakistan to Sweden. The Pakistan Overseas Scholarship Scheme is also administered by the Swedish Institute. It was created after a formal agreement on collaboration in research and research training between Pakistan and Sweden, that was signed on 1 November 2004. The programme is exclusively open to Pakistani nationals aiming to pursue Master and PhD studies in Sweden. Applications for the Overseas Scholarship Scheme for Masters and PhD for Pakistani nationals are made directly to the Pakistan Higher Education Commission (HEC). The aim of the program is to strengthen Pakistan’s national research capacity through educational cooperation between Pakistan and Sweden. More information. Since 2008 no new grants have been available from the Pakistan Overseas Scholarship Scheme, but a large number of scholarship holders are carrying out their training at different Swedish universities. Finally, the Swedish Institute has administered a bilateral scholarship programme with India. Every year, the Indian government through the Indian Council for Cultural Relations (ICCR) used to offer 1–2 Swedish students the possibility to study dance at at an Indian academic institution. The scholarships covered tuition fees, and board and lodging costs, and were primarily given to university students below 35 years of age that wished to pursue 1–2 years of training in dance or music in India. The programme has however been cancelled. Offers grants for research on International Studies with special relevance for security and foreign policy. Under the auspices of the Ministry of Education and Science, the Swedish Research Council offers research grants to all the disciplines. In 2001 it replaced the separate research councils for science; medicine; etc, that existed previously. The total budget is 2 500 Million SEK a year. The Swedish Research Council provides support for basic research of the highest scientific quality in all fields of science. The goal, as formulated by the Swedish Government, is to establish Sweden as a leading research nation. There are three scientific councils within the Swedish Research Council: one for Humanities and the Social Sciences, one for Medicine and one for the Natural and Engineering Sciences. It also includes a Committee for Educational Science and a Committee for Research Infrastructures. The Swedish Research Council is one of the most important funders of Swedish South Asia related research. The Swedish Research Council is the single largest provider of public funds for Swedish basic research. Grants are allocated through a peer review process – a system to assess quality and establish priorities that involves many groups of leading researchers who assess the grant applications of their peers. The main categories of research grants are: • Project grant; • Staffing grants (mainly for research consultants and research assistants); • Stipends (postgraduate and European University Institute doctoral candidates); • Major/expensive equipment grants; • Conference and travel grants; and • Publication grants. From 2005 the Swedish Research Council has extended the grants programme for International post-docs to cover all sciences, including humanities, social sciences and educational science that previously were taken care of by STINT (see above). Applications for ordinary project grants from the Swedish Research Council should be submitted before 30 March 2011 (regarding Humanities and Social Sciences; and Artistic Research & Development); before 6 April (regarding Medicine and Health); 13 April (regarding Natural and Engineering Sciences); 19 April (regarding Educational Sciences; and Research Infrastructures). Full information about the general announcement. Introduced by Sida and the Swedish Research Council in 2002, Swedish Research Links aim to stimulate cooperation between researchers in Sweden and those in selected developing countries. The long-term aim of the programme is to contribute to mutual scientific and socioeconomic development of the countries involved through funding for support to collaborative research projects of high scientific quality and mutual relevance. The programme is open to researchers in basic and applied research within all academic disciplines. The Swedish Research Links Programme is funded by Sida but administered by the Swedish Research Council. The grant should normally be administered by a Swedish university or higher education institution, or another public organisation in Sweden engaged in research (administrative entity). The Programme aims to foster research ties between researchers in Sweden, on the one hand, and researchers in in Asia, the Middle East, Africa, Latin America, and the Balkans on the other. The key condition for the Swedish Research Links Programme has been that researchers from the countries involved must submit joint applications on projects of mutual interest. In South Asia the countries eligible for participation in Swedsh Research Links programmes are Bangladesh, India and Sri Lanka. No grants were distributed from the Swedish Research Links programme in 2010, during which time the programme was evaluated, but in July 2011, a new announcement was published regarding applications for the period 2012–14. These International Collaborative Grants are awarded for maximum three years, and the maximum amount to apply for is SEK 250,000 a year. The grant can be used to cover joint activities, such as research visits between the partners, seminars, workshops and joint publishing. Minor project costs may also be funded at a maximum of SEK 50,000. The grant may not be used for salaries and scholarships. Deadline for submitting applications is Tuesday 6 September 2011. Full information about the Swedish Research Links programme for 2012-14. It is a strategic granting and co-ordinating actor in the Swedish innovation system, contributing to long-term economic growth and sustainable development in both ecological and social terms by funding problem-oriented research in order to meet the needs of industry, society at large and by developing effective innovation systems. Research funding 2007: approx SEK 1 700 million. Due to the required matching funding from other financing bodies, the sum of available resources is twice as large. Go to the web page with VINNOVA’s announcements for grants. The Asia-Link Programme is an initiative by the European Commission to promote regional and multilateral networking between higher education institutions in Europe and developing countries in Asia. The programme aims to promote the creation of new partnerships and new sustainable links between European and Asian higher education institutions, and to reinforce existing partnerships. Project partnerships should involve at least two European partners (from different countries) and at least two Asian partners. The Commission grant can cover 75% of the total eligible costs of the project, up to a ceiling of EUR 750 000. The Commission may however cover up to 90% of the total eligible costs for projects in which the Asian partners come only from least developed countries (Afghanistan, Bangladesh, Bhutan, Cambodia, East Timor, Laos, Maldives, Nepal). Since 2002, the Programme has funded 155 partnerships that together involve over 700 higher education institutions from Asia and Europe. See the list of all 155 projects. SASNET has made a separate list of the five projects (out of 30 funded projecs) that included South Asian partners and were approved in the year 2004. South Asia related projects funded in 2004. The programme also allows for joint, cross-thematic approaches to research subjects of common interest. 2. Ideas (€7.5 bn): refers to the establishment of an autonomous European Research Council (ERC ), which will support and stimulate basic research carried out by individual teams competing at European level. The ERC has already been established and it has published its draft work programme for 2007. 3. People (€4.7 bn): refers to the so called 'Marie Curie' actions, which strengthen training, the career prospects and mobility of European researchers. Special focus will be given to skills and career development, increasing mobility between university and industry, and strengthening links with national systems. 4. Capacities (€4.2 bn): refers to developing and fully exploiting the EU’s research capacities through large-scale research infrastructure, regional cooperation and innovating SMEs as well as increased international co-operation and bringing science and society closer together. Since 2004, the European Commission (EC) has run the successful Erasmus Mundus Programme, a flagship programme aimed at promoting the attractiveness of the European Higher Education system and third country cooperation and partnerships (more information about the programme). In addition to this, the EC in 2007 introduced an additional mobility scheme titled Erasmus Mundus External Cooperation Window (EMECW), designed to foster co-operation between higher education institutions and the exchange of students, researchers and academic staff from EU Member States and targeted so-called Third-countries. It complements current and previous schemes such as Tempus, ALFA, AsiaLink, Alban, Edulink, Erasmus, and the general Erasmus Mundus, providing funds for the organisation and implementation of student – from undergraduate to post-doctorate level – and academic staff mobility flows. In 2008, the scholarship expanded with new lots focusing on South Asia. The European Commission decided to implement a separate lot (nr 15) to promote academic collaboration between EU and India. The responsibility for this lot was given to a consorium of 20 partner universities in Europe and India, coordinated by Lund University, with flow of 320 fully funded students/researchers/academic staff. The programme has been launched during 2009. See the consortium web page. Three other lots focusing on South Asia were launched in 2008. One of them has been coordinated by Mälardalen University in Västerås. More information about this so-called EURECA project. In June 2009, the European Commission decided about EMECW projects for the year 2009-10. The Lund University coordinated project (see above) was again selected, but now as one of four projects within the India Lot No. 13, whereas two other lots were selected for other countries in South Asia. Full information about the six India/South Asia related EMECW projects 2009-10, and the three remaining 2008-9 projects that are still working. NorFA is an organisation within the Nordic Council of Ministers, and a platform for development of Nordic research training and research co-operation. NorFA offers funding for research programmes, as well as Nordic graduate schools in social sciences and the humanities. In 2002 NorFA issued a call for proposals for establishing research schools, and out of 50 proposals 10 were selected to prepare an actual application for funding. One of these proposals was NorfAsia, headed by Professor Björn Hettne, PADRIGU, Göteborg University, and planned to have its administration at the Nordfic Institute fo Asian Studies, NIAS in Copenhagen. The proposed research school, strongly supported by SASNET, should focus on societal dynamics, conflicts and human security in contemporary Asia – including South Asia. It would also give priority to history, politics and culture; work at different levels in Asia, i e village, sub- region, nation, and wider regions; and also promote a comparative approach. According to the proposal NorfAsia should become a virtual institution where students would be inscribed with their own Nordic academic institutions which would have the authority to conduct examinations and award degrees. NorfAsia was supposed to start its work on 1 January 2004 but unfortunately it failed to pass the second round of applications. Some of its proposals may however be realized in other forms. More information on the NorfAsia reserach school application (as a pdf-file). NORFAC is a partnership between twelve research councils to increase co-operation in research and research policy in Europe, run during a project period 2004–09. The twelve partners involved are the research councils for the social sciences from Estonia, Denmark, Finland, Germany, Iceland, Ireland, The Netherlands, Norway, Portugal, Slovenia, Sweden and the United Kingdom. Canada and Austria participate in NORFACE as associate partners. NORFACE receives core funding from the European Commission's 6th Framework Programme, under ERA-NET scheme. For social science researchers in its partner countries NORFACE offers: • Support for cross-national research of excellence; • New and exciting funding opportunities; • Facilitation of new multinational collaborations; • Improved dialogue between reseachers and funding agencies; and • Co-operation for the enhancement of the social sciences. Information about funded projects. in Manilla, the Philippines, offers an Internship and Research Fellowship Program. This is a research-project-oriented learning program with topics varying widely from year to year depending on ADB’s business needs. Past internship projects ranged from energy conservation in the People’s Republic of China and capacity development in South Asia to small and medium enterprise development in Azerbaijan. The Program gives students and academic faculty members the opportunity to work in an ADB project, contributing to its success and sharing knowledge with its officers. The purposes of ADB's Internship and Research Fellowship Programs are to offer the opportunity to work in a major international development organization with a multicultural environment; to gain a deeper understanding of development finance and the impact of ADB; to expand knowledge by learning from experienced professionals and apply it to educational and practical experience; and to present research outputs in a public forum at ADB. The ADB internship application process goes ONLINE for the 2011 Internship intake. The Internship Assignments will be posted on 2 November 2010. More information about ADB’s Internship and Research Fellowship Program. The SSRC promotes international scholarly collaboration on South Asian regional studies. The Centre for Studies in Social Sciences (CSSSC) in Kolkata, India acts as a partner organisation for SSRC's South Asia Regional Fellowship Program. This is a multi year fellowship opportunity for college and university teachers based in South Asia. Every year, a theme of regional significance is chosen and fellowships are awarded through a competitive process. Applicant eligibility is restricted to those permanently residing and teaching in Bangladesh, India, Nepal, Pakistan and Sri Lanka. There are no citizenship restrictions. Eligible applicants must hold a Ph.D. in the social sciences, humanities, or related fields. As many as 20 fellowships may be awarded to college teachers and university faculty teaching in the social sciences and humanities across South Asia annually. Up to fifteen fellowships are reserved for junior scholars (less than Professor rank), and no more than five for senior scholars (Professor rank and above). The primary intent of the fellowship is to write up completed research. The program is supported by a grant from Ford Foundation. The IFP funds graduate studies for students from certain countries in the Third World. In South Asia this applies only to India. The RCC offers Human Development Academic Fellowships for for citizens of the Asia-Pacific countries. The aim of the fellowships is to analyse issues from the human development perspective, with a focus on fostering creative thinking and innovative research on the subject among young people. The research must focus on a well-defined aspect of human development, could be theoretical, applied, policy-oriented or a combination and must amount to a substantive contribution to human development thinking relevant for the region. The Fellowship is intended for young PhD students who are at an advanced dissertation stage working on a topic related to human development – theoretical, applied or policy oriented. More information about the UNDP Academic Fellowships for Asia and Pacific. International students coming to Sweden are allowed to work in Sweden once they receive their residence permit for studies. You do not need a special work permit. If you have applied for an extension of your residence permit for studies, you may continue to work while waiting for the answer if you made your application while your earlier permit was valid and you have had a residence permit for studies for at least six months. As the Swedish language is commonly used in most work places it is however difficult for non-Swedish speakers to find ordinary work. More information from the Swedish Migration Board.